In a glittering ceremony at its Punjab campus, Chitkara University conferred the Doctor of Literature degree on Dr. Devinder Singh Rana, Chairman, Sir Ganga Ram Hospital, New Delhi; in recognition of his outstanding contribution to Medicine, Education & Humanity, owing to his inspirational journey as a pioneer in Medicine and playing a stellar role in creating significant impact in the domain of healthcare delivery and community outreach. Dr. Devinder Singh Rana has had a distinguished career in Medicine and has been lauded world over for his pioneering work in Nephrology. His contributions towards Nephrology, Dialysis and Kidney Transplantation led him to be the President and Secretary of the Indian Society of Nephrology, where he founded the Indian Society of Hemodialysis (2002), to standardize the procedure of hemodialysis. He has received Dr. B.C. Roy National Award (2017) and Padma Shri Award (2009) by the Hon’ble President of India for his great contribution in his field. His services in promoting medical education led him to be awarded the Tridecennial NBE Medical Teacher of Excellence Award (2012) and the Best DNB Teaching Hospital Award (2014) by the National Board of Examinations. 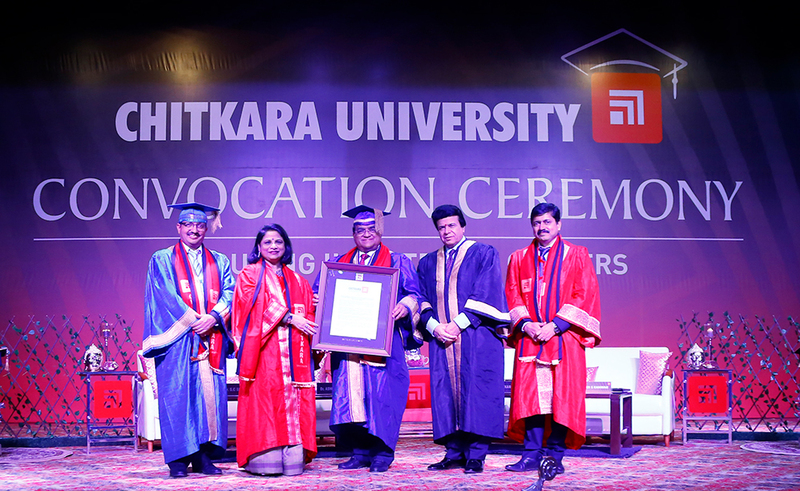 The special convocation was presided over by Hon’ble Dr. Ashok K Chitkara, Chancellor, Chitkara University; Hon’ble Dr. Madhu Chitkara, Vice-Chancellor, Chitkara University; Dr. Varinder S. Kanwar, Vice-Chancellor, Chitkara University, Himachal Pradesh; and Dr. S C Sharma, Registrar, Chitkara University, Punjab. On receiving the degree, Dr. Devinder Singh Rana expressed his deep gratitude towards Chitkara University for bestowing him with this honour and congratulated Dr. Ashok K Chitkara and Dr. Madhu Chitkara for the achievement of building this great educational institute on the basis of sheer determination, passion and hard work. He suggested students take inspiration from their ‘persistence’ to achieve their dreams. The Honoris Causa Doctorate at Chitkara University is meant to acknowledge and felicitate distinguished personalities in the country who have made commendable contributions in the field Of Science, Engineering, Entrepreneurship and Academics.